We have re-posted this article this year since seed starting is always a popular inquiry at this time of the year! Get a head-start on your garden by growing certain vegetable plants indoors, including tomatoes, peppers, pumpkins, eggplant, broccoli, brussels sprouts, celery, cauliflower, and others. By starting certain seeds indoors, you eliminate the risk of frost damage and ensure yourself a hardier plant that will produce more through the growing season! The general rule of thumb is to start plants indoors 4-8 weeks prior to the last spring frost, which for the Pittsburgh area is around May 1st. Individual crops will vary, but tomatoes and peppers are some of the most commonly planted vegetables and ones and should be started indoors about 8 weeks prior to the last frost! Below, we have made some suggestions for improving your results with indoor seed starting. Containers: Almost any container that is 2-3 inches deep will work as a planter, provided that there are some holes at the bottom. You can use plastic seed-starting trays that are divided up in small cells, or any other container with a similar shape. Egg cartons are a great option if you are looking to reuse something around the house! Some people even choose to place seeds in a tray and then once they sprout to transplant them quickly to a larger container, so that they can be started in a smaller space at first. Regardless of the container, you will want to place them on a tray that will allow you to water them from the bottom up. If seedlings have outgrown the container they are in, be sure to move them to a larger pot or planter so that their grown is not stunted. Biodegradable peat pots are a popular item because they can be planted directly in the soil once ready to be transplanted outside. Soil: A fine, light and fluffy (or spongy) growing medium is most desirable. If the soil is too heavy or thick, roots will not be able to push their way through (do not use a garden soil or top soil). Many companies package a seed-starting soil mix that is highly moisture retentive and includes some fertilizer to help them grow quicker. Expandable peat pellets or coconut coir are also available at most garden centers and work very well too. You can even make your own mix with equal parts vermiculite, perlite, and milled sphagnum peat moss. If making your own mix, you will want to start feeding your seedlings a few weeks after they germinate with a liquid fertilizer, preferably an organic choice! Sunlight: Sunlight is crucial for seedlings to grow rapidly, since it promotes the photosynthesis process. This can be obtained by natural sunlight through windows or preferably from light bulbs positioned directly above the growing medium. Ideally, you will want to position the high intensity light about 3 inches from the seeds or seedlings and raise the light as they grow. There are grow lights sold typically sold in 2 or 4 ft lengths, or you can make your own out of chain and shop lights of some sort. Light is most critical once the seedlings have emerged. Temperature: The ideal soil temperature for seeds to germinate is about 78 degrees, although it can vary depending on the plant. Because this is warmer than most of our homes at this time of the year, we recommend placing your seed trays on top of your refrigerator or a couple inches above a radiator. Sunlight is not a necessity to promote germination, so you want to look for a warm pocket in your home and place your seeds there. Once sprouts have reached about 1/2 inch, you will want to move your seeds to a cooler environment (between 60-70 degrees) where they will receive the most sunlight possible. Water: When seeds are germinating, you will want to create a humid environment by placing a clear plastic lid (often sold with seed-starting trays) or loose fitting plastic wrap or grocery bags over your growing medium. Once seeds have emerged, remove the lid and water seedlings from the bottom only. This technique will resist disease and not disturb seedlings when they are small and fragile. Check Them Daily: We recommend that you place your seed trays in an area that you will be able to conveniently check them each day. You will want to make sure that lids don’t need removed, water replenished, or lights adjusted among other things. If plants are put on a windowsill, you will want to rotate them every couple of days to make sure that they do not get pulled in one direct too much. These are all things to pay attention to and are important for the most success this year! Preparing Them For The Outdoors: You will want to be sure that you “harden” your plants to the outdoors. 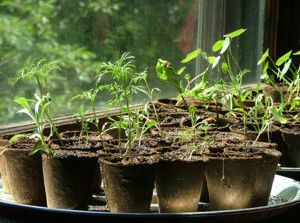 Instead of planting them quickly outside, you will want to acclimate your seedlings to the outdoors, by moving them outside during the daytime for a couple of hours each day over the course of 2 weeks. If you are not sure which seeds need to be started indoors and what can be sowed directly in the garden, be sure to reference the backs of each seed package. All of this helpful information is directly on the label so that you can time out everything on the calendar. Also, seeds packets include many, many seeds. Not all seeds will germinate and not all will be of the same strength, so you may want to “weed out” those that are not as strong and pay more attention to the stronger plants/seedlings because it is often not practical to have 10-20 plants of each variety in your garden. Thanks for reading, and Happy Gardening!